روشندل کاهو, امین, نجاتی کلاته, علی. (1392). کاربرد فیلتر کمینه واریانس در تضعیف نوفه‌ خط‌های انتقال نیرو. مجله ژئوفیزیک ایران, 7(1), 79-88. امین روشندل کاهو; علی نجاتی کلاته. "کاربرد فیلتر کمینه واریانس در تضعیف نوفه‌ خط‌های انتقال نیرو". 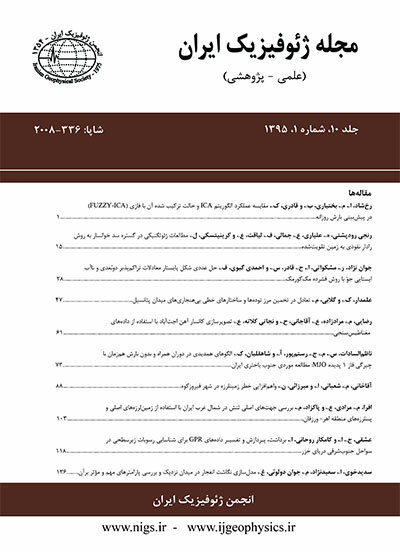 مجله ژئوفیزیک ایران, 7, 1, 1392, 79-88. روشندل کاهو, امین, نجاتی کلاته, علی. (1392). 'کاربرد فیلتر کمینه واریانس در تضعیف نوفه‌ خط‌های انتقال نیرو', مجله ژئوفیزیک ایران, 7(1), pp. 79-88. روشندل کاهو, امین, نجاتی کلاته, علی. کاربرد فیلتر کمینه واریانس در تضعیف نوفه‌ خط‌های انتقال نیرو. مجله ژئوفیزیک ایران, 1392; 7(1): 79-88. نوفه یکی از عوامل مهم تخریب اطلاعات موجود در داده‌های لرزه‌ای بازتابی به‌منظور شناسایی مخازن هیدروکربوری است. نوفه‌های موجود در داده‌های لرزه‌ای همدوس یا ناهمدوس هستند. نوفه خط‌های انتقال نیرو یکی از متداول‌ترین نوفه‌های همدوس در داده‌های خشکی است و به‌صورت هماهنگ‌‌های تک‌بسامد با دامنه‌های بزرگ روی داده لرزه‌ای دیده می‌شوند. یکی از مراحل پردازش داده‌های لرزه‌ای، تضعیف نوفه‌های موجود در داده‌های لرزه‌ای است. روش متداول برای تضعیف نوفه خط‌های انتقال نیرو، فیلتر ناچ است. در این مقاله از فیلتر کمینه پراکنش برای تضعیف نوفه خط‌های انتقال نیرو استفاده شده و نتایج آن با فیلتر ناچ مقایسه می‌شود. نتایج نشان می‌دهد که فیلتر کمینه پراکنش در تضعیف نوفه خط‌های انتقال نیرو بهتر از فیلتر ناچ عمل می‌کند. Noise is a factor that influences the reliability of the seismic data to provide a better understanding of the hydrocarbon reservoir characteristics. Coherent and random (incoherent) noises are two important types of noise that contaminate the seismic reflection data. Power-line noise falls in the coherent type of noise (Yilmaz, 2001; Sheriff and Geldart, 1995). It is a class of noise often existing in land acquisition in populated areas. It produces a characteristic 50 or 60 Hz sinusoidal noise on seismic reflection traces and covers the seismic data from reflectors. Its amplitude is time invariant, whereas the seismic data amplitude decays with time (Xia and Miller, 2000; Dingus, 2010). Coherent noise attenuation, particularly power-line attenuation, is one of the problems in seismic reflection data processing. Several methods have been introduced for elimination of power-line noise from seismic reflection data. Xia and Miller (1998 and 2000) predicted the amplitude and phase of a harmonic using the Levenberg-Marquart method and subtracted the harmonic constructed by the predicted amplitude and phase from the seismic trace to attenuate the power-line noise. where the value of is chosen in a way that the maximum absolute value of is one. Because of the adaptive characteristics of the minimum variance filter, it is expected that the proposed method to produce better results than a notch filter. Therefore, to evaluate the efficiency of the minimum variance filter method to eliminate the power-line noise, we test the proposed method on both synthetic and real reflection seismic data. The output of our method is compared with the results of a notch filter. The results showed that the minimum variance filter method can attenuate the mono-frequency power-line noise from seismic traces better than the notch filter method. The results are compared in both time and frequency domains, and an improvement in power-line noise attenuation is observed using our method in both time and frequency domains. روشندل کاهو، ا.، 1388، بهبود تبدیل‌های زمان – بسامد در مطالعه داده‌های لرزه‌ای، رساله دکتری، موسسه ژئوفیزیک، دانشگاه تهران. Costain, J. K., and Coruh, C., 2004, Handbook of Geophysical Exploration, Seismic Exploration, Basic Theory of Exploration Seismology: Elsevier. Dingus, C., 2010, Seismic processing – noise attenuation techniques for relative amplitude processing: Petroleum Africa, December, 47-49. Marple, S. L., 1987, Digital Spectral Analysis and Applications: Prentice Hall. Marquardt, D. W., 1965, An algorithm for least squares estimation of nonlinear parameters: Journal of the Society for Industrial and Applied Mathematics, 2, 43l-441. Proakis, J. G., and Manolakis, D. G., 2007, Digital Signal Processing, Principles, Algorithms, and Applications: Pearson Prentice Hall. Sheriff, R. E., and Geldart, L. P., 1995, Exploration Seismology: Cambridge University Press. Xia, J., and Miller, R. D., 1998, Hum filter: Power-line noise eliminator for shallow seismic data: Proceedings of the Symposium on the Application of Geophysics to Engineering and Environmental Problems, 1043-1052. Xia, J., and Miller, R. D., 2000, Design of a hum filter for suppressing power-line noise in seismic data: J. Environ. Eng. Geophysics, 5, 31-38. Yilmaz, O., 2001, Seismic Data Analysis: Society of Exploration Geophysics.